Now you might be asking, why would I want to take a gimmicky tourist-centric tour of the city? Is that really the best way to see San Francisco? Whenever I travel - regardless of where, I ALWAYS take a city tour. Taking a city tour isn’t just about being sucked into the vortex of the visiting cities tourism industry. 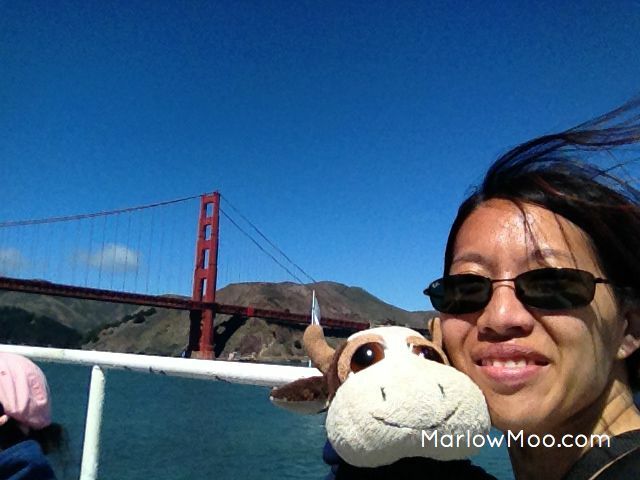 For Moo, taking a city tour serves two purposes: firstly, it allows you to orient yourself to the city. Distances on maps can be deceiving, going on a city tour can allow you to see for yourself how close or far away things are to each other, as well as get a sense of how the city is laid out. Secondly, city tours allow you to hit most of the major tourist attractions in a city in a short period of time. Although it doesn’t allow you enough time to see everything properly, it does give you a sense of what you do or do not want to spend more time at. Sometimes things are not as interesting as you think they will be, or are perhaps smaller and you realize there’s no point in allocating half a day to return somewhere. On the other hand, you might realize some places are more interesting or will require more time than you’d originally planned, allowing you to adjust accordingly. Also if you aren’t going to be in town long, at least a city tour will allow you to see a lot in a very small amount of time. When picking a tour, I recommend doing some research and to stay away from big bus tours such as Grayline. Although they tend to be inexpensive, many of their tours are pre-recorded therefore lacking the human touch of having a live tour guide pointing out the sights. Also, large tour groups mean larger tour busses, which often cannot get into smaller roads, meaning that you’ll simply drive by interesting places and won’t be able to get very close. Lastly, the tour group sizes are larger, so you’ll be less likely to be able to stop and get off the bus, meaning the majority of your photos will drive through shots, taking through the glass of a large tour bus. Don’t forget to bring a bottle of water and some snacks with you as there won’t be any time to stop to and buy drinks or snacks on these tours. I'll do a separate tour on logistics of making sure you're prepared for a day out anywhere you travel. Smaller tours on the other hand not only provide you with a live tour guide but are usually done in smaller vehicles, allowing you to pull right up to many of the attractions. As well, the number of participants on the tour are smaller, so you have more opportunity to actually get out of the vehicle to take photos, wander around a bit, stretch your legs, and gives you the opportunity to have the all important bathroom break part way through the tour. As well, if you’re going in the off-season, your tour group might be small enough to allow you to customize your tour. I have been on tours in the past where it was myself, my humans and one other person, allowing the tour guide to take us to other locations we were interested in, but wasn’t necessarily part of the tour. You’ll have to do a bit of research to figure out which tours are good and which are not. I usually rely on TripAdvisor reviews, particularly ones with a lot of details, to figure out the best company to go with. I’ll discuss walking tours in a separate post, as they are more detailed than city tours, but don’t cover as much ground. These tours are great if you have more time to explore a city neighbourhood by neighbourhood and are particularly interested in a specific area of town. However if you want to see a lot and don’t have a lot of time to spend, then a walking tour isn’t the place to start. There are countless places along Fisherman’s Wharf that offers cruises of the bay, along with a multitude of ways and times to explore it – during the day, at sunset, with food, with wine, slowly, on a fast ship, on a catamaran, etc., just pick what works best for you. They have tours of a variety of prices, lengths and focuses, where some will go around the bay in an hour, while others will spend extra time going around Alcatraz. It’s a great way to get out on the water, to see San Francisco from a different vantage point, get beautiful pictures of the San Francisco cityscape, get eerie pictures of Alcatraz from the water, and experience going under Golden Gate Bridge. Although you can sit inside, it’s always best to sit on the upper deck outside, particularly if you want to take pictures. Try to get inline early so that you are near the front and can hightail it to the upper deck. Try to grab a seat next to the railing and that way you will have an unobstructed view to see all the sights and take pictures. It can get cold on the water, even if it’s a warm sunny day on land, so don’t forget to pack a jacket because you’ll need it once you’ve on the bay for a while, particularly if there’s a breeze that day. Again, check Google to see what companies will do bay cruises and check TripAdvisor for reviews of each company. Try to read the most recent reviews first, as sometimes reviews are sorted by ratings as opposed to dates. This can be important as sometimes you can get a whole slew of negative or positive reviews in a certain time period, which could indicate a change in staff for the worse or for better, letting you know whether or not the company is still a good choice or not.